If you are attending GA and are planning to stay in a hotel, please make your reservation using the GA housing reservations system. Beginning on March 1 at 9:00 a.m. central, you can make your hotel reservation at one of the five wonderful hotels in our block — all of which are within a 10 minute walk to the Minneapolis Convention Center. 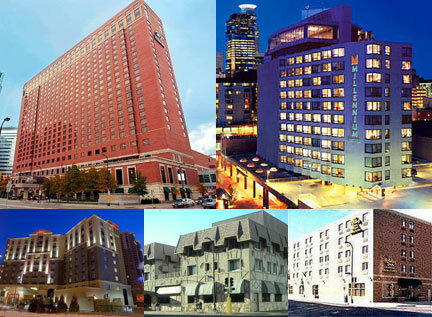 Choose from the Hilton Minneapolis (our headquarter hotel), the Millennium, the Hilton Garden Inn, the Best Western Normandy Inn and Suites, and the Holiday Inn Express. For you rugged money savers out there, we also have a block of dormitory rooms at the University of Minnesota. The dorms are accessible to the Convention Center by public transportation. Detailed housing information is now available. So many great options; see below for more information on how to choose! We recommend making your reservation early as the least expensive hotels and the hotels closest to the convention center will fill up very quickly! Listen to our most recent podcast to hear more about each hotel straight from the hotel staff! NEW THIS YEAR — Folks in need of accessible hotel accommodations will also be using the GA housing reservations system to make their reservation. In the past, we waited until all requests for accessible rooms were in before matching available ADA rooms to the level of each person’s needs. This led to unfavorably lengthy delays between making a request and receiving a hotel confirmation. While this new system will provide prompt confirmations, it also favors a first come, first served model. Please know that GA staff will be monitoring all reservations made with ADA requests to make sure that as many people as possible get a hotel room that is appropriate to their level of need. Please find more information with detailed instructions by clicking here. Please fill out a separate form to reserve equipment or services such as scooters, wheelchairs, mobility orientation for visual impairment, FM receiver system, etc.